Do we return to markets alone or accept an overdraft safety net? It's the next big question facing the State. Should we go it alone after December 15, or should we apply for a precautionary credit line to give us that extra bit of insurance as we move from bailout to full-time access to the global money markets? Finance Minister Michael Noonan is in a series of international meetings involving the troika, to gauge our best exit options. If we were to take an overdraft facility, the Government hopes that we will never have to use it and it will simply be a safety net. But as the old cliche goes, the devil is in the detail, and the fine print of any credit line needs to be examined closely by the Government. If we were to take a backstop, what conditions would be imposed upon Ireland? Mr Noonan has stressed that any decision on whether to take a credit line, either from the EU or from the IMF, would depend on what they force us to do in return, signalling that if the conditions were too onerous, we wouldn't be interested. 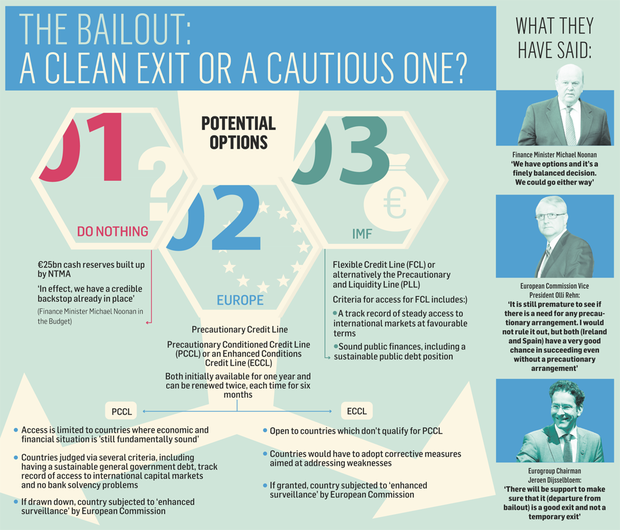 Europe offers credit lines through its €500bn bailout pot, the European Stability Mechanism (ESM). It provides a Precautionary Conditioned Credit Line (PCCL) or an Enhanced Conditions Credit Line (ECCL). Both have an initial availability of one year, and can be renewed twice, each time for six months. According to ESM rules, a PCCL is limited to countries with a "fundamentally sound" economic and financial situation. Countries would be judged eligible via several criteria, including having a sustainable general government debt, a track record of access to international capital markets, and no bank solvency problems that could threaten the euro banking system's stability. Access to ECCL is open to countries that don't qualify for PCCL, with the rules stating that the country has to adopt measures to address weaknesses. Where an ECCL is granted or a PCCL drawn, the country would be subjected to "enhanced surveillance" by the European Commission, and would also have to allow regular review missions by the Commission and IMF. The IMF appears to offer two possibilities – a Flexible Credit Line (FCL) or alternatively the Precautionary and Liquidity Line (PLL). To access the FCL, a country needs to have a track record of steady access to international markets at favourable terms as well as having sound public finances, including a sustainable public debt position. Refusing to take some form of so-called backstop may reduce the level of oversight by international officials. However, new European budgetary rules mean that enhanced surveillance by European authorities will happen anyway. Under the so-called Six Pack and Two Pack, all euro area governments are being more closely watched, including having to submit draft budgets to the European Commission, who will assess whether the numbers comply with common finance rules. European Commission Vice President Olli Rehn has said we could succeed without a precautionary programme, while Mr Noonan said the €25bn is a credible backstop in itself. But Citigroup chief economist Willem Buiter said turning one down would be foolhardy, while ratings agency Moody's said it would be a "practical way" to boost investor confidence.